led me and asked how he could use Google Analytics to segment our state into four sales territories. Unfortunately, the GA interface only allows for segmentation by city – region – country etc. But we can use either Advanced Segments or the filter in Custom Reports (in the newest version of GA) to aggregate cities and thereby create a sales territory (or if you like, a Metropolitan Statistical Area, depending on your needs.) In face, the very first step, no surprise, is to figure out your needs. Figuring out your needs. Let’s say that you’ve decided to segment by corner of the state. I live in W. Pennsylvania, and would like to create a W. PA segment. 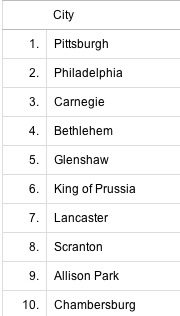 I could go into GA and look at all the cities in PA, like the long list on the side here. 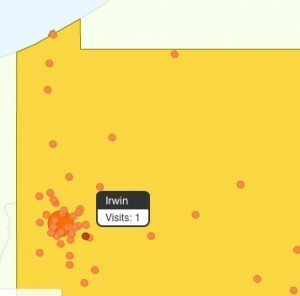 See how Irwin shows up with its one little visit, and now I know to include it in the SW sales territory for PA? Then go through and repeat for other sales regions. A little tedious, but you only have to do it once. Problem: what about other cities that “appear?” Despite all my work above, other cities in my W. PA sales area will crop up over time, because they were too small to have any visits when the work was first done, even if I did use all the data that I had. So how do we know that visits came from a “new” city? And that’s when I realized that if we created the Advanced Segment using Regular Expressions, the way I did above, everything would be easier. We could visit our sales territories segments every quarter, and for each one, change the first field from “Include” to “Exclude.” Apply those segments. After all, if we create a segment for North, East, West and South, then exclude them all from a state, then look at that state — there should be no cities in that state. If there are, we have found the few stragglers we were looking for. 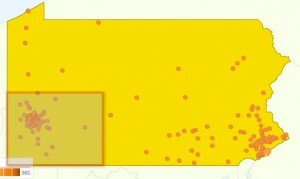 Any other ideas on how to do this kind of sales territory or MSA work?